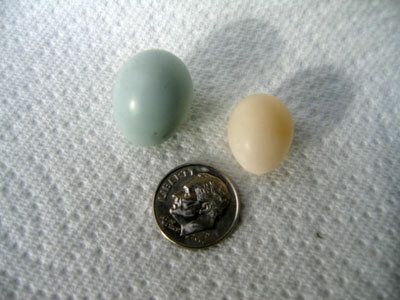 The Oak Titmouse (Baeolophus inornatus or OATI) egg relative to a Western Bluebird Egg and a dime. Photo by Larry Jordan of California. See his blog. OATI's are found in western woodlands. The eggs are white, smooth and non-glossy or slightly glossy. 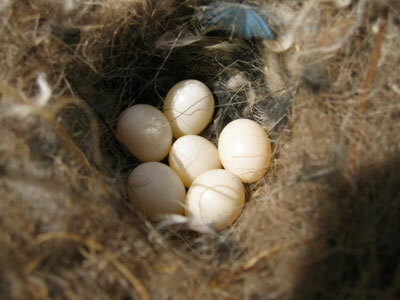 Some have tiny pale reddish-brown speckles evenly and sparingly scattered over the egg. Oak Titmouse nest. Photo by Larry Jordan. 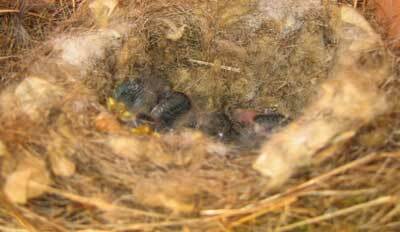 Their nest is a base of moss, next fine grass, then a thick topping of fur or hair (e.g., rabbit, cow, horse, squirrel, skunk). They may also have shredded bark, straw, twigs, plant down or fibers, rope or string, oak blossoms, snakeskin, sycamore seed balls, rootlets, leaves or wood chips. 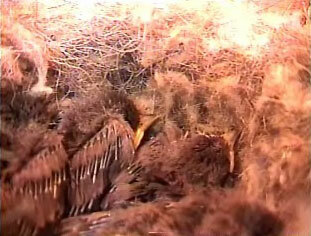 About half have feathers. The cup is deep and usually is filled with a wad of fur as a "blanket" to cover eggs while the hen is laying. 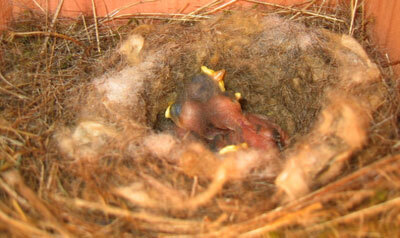 The nest is similar to that of a Juniper Titmouse,which may have more hair and shredded bark. 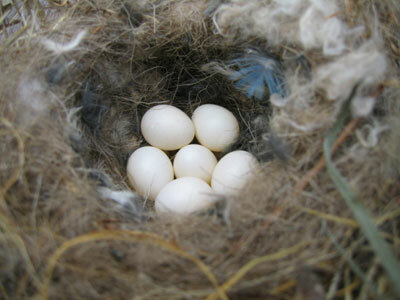 OATIs have 3-9 eggs, with 6-7 being typical. Newly hatched OATIs (day 0). Photo by Larry Jordan. Same OATIs. Photo by Larry Jordan, taken around Day 4. These OATI's are about 1 week old. Photo by Larry Jordan.